When Jon Kolko and I were the Editors-in-Chief of interactions magazine, we would end most issues with a “cafe” conversation on topics of relevance to that issue’s content. We thought we’d resurrect such conversations on topics of relevance to the world of design today. This is our second such resurrection. 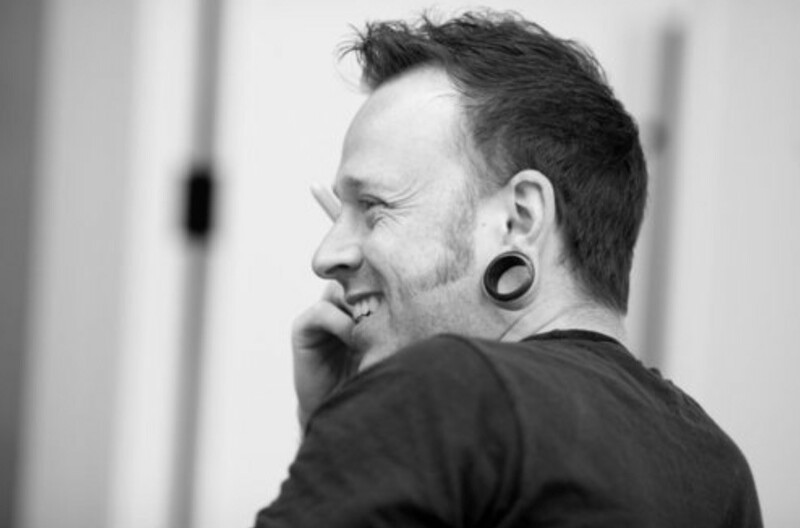 Richard: Not long ago, I was being interviewed for an opportunity to design and deliver workshops and (other) educational activities to enable multidisciplinary teams to (more) effectively use design and design thinking in their work. I’ve done lots of this type of work during my career, I enjoy it, and I’m very good at it, and I was delighted by the nature of the company with which I was discussing the opportunity. But the hiring manager knew that I had recently taught the advanced theory course at the Austin Center for Design (AC4D), and she repeatedly emphasized that no theory was to be taught at the company and later confirmed that she was afraid that I would insist on doing so. You established the two theory courses that are a part of the AC4D curriculum, and you’ve written about the importance of teaching theory to design students. But is there no place for theory in a professional work environment? Jon: I’ve never understood why practitioners make such a big deal about learning theory; it’s as if knowing the history, ethics, or philosophy behind your profession somehow makes you bad at actually doing the work! I also see theory as akin to business writing; I don’t think people would argue that those who read BusinessWeek or Harvard Business Review are somehow being too academic, yet that’s what we do with design theory. Part of that is our own fault; design theory is heady stuff, often using overly sophisticated language that bullies a reader. But the style aside, the writing is critical for acting as a foundation for work. When I talk to some of my alumni, they describe that their education grounded in theory gives them a reason to go to work — it provides them with a level of substance for justifying both their individual design decisions as well as their project and career selection criteria. That is, without a theoretical scaffold to guide decision making, all decisions are equal — and that means there’s no way to decide if a project is worth your time or not. I do know that there are some academics who venture into practice and are surprised that their intellectual rigor alone (without practitioner skills) falls flat. That seems equally naïve to me. It’s hard to claim to be a designer without being able to actually design things. I’ve written a little about this before and my biggest personal reflection is that if I hire someone without a deep theoretical understanding of our profession, I’m hiring a set of hands. Sometimes, I want a set of hands to creative direct — someone who can make things, and I can tell them what to make and often how to make it. But that’s not what I want for my alumni. I want them to be in strategic roles where they make decisions, and to have confidence that the decisions they are making are sound. Did the hiring manager you spoke with add any more details about why she was so afraid, or did you get a sense for where that fear comes from? Richard: I think many people don’t understand the full extent of what design theory is, let alone its importance to practice. What makes theory “theory”? What makes theory “important” or “useful”? I think if people better understood the answers to these questions, fewer people would fear theory. Jon: Design theory is a way of explaining design. It’s a point of view or perspective, often gathered through research or observation of human-built phenomena. Design is not science; our consideration is not with the natural world, but with the human-created world. That means we can study and discuss various perspectives on the role of technology in shaping culture, in the qualities of rich and useful experiences, or on the way designers work and think. For example, Paul Dourish’s article “What We Talk About When We Talk About Context” offers perspectives on the context of digital technology. Context, in this case, doesn’t mean the physical environment, but the social environment in which an innovation is found. He presents several alternative perspectives on how technology is presented to the world. One is the positivist approach, which is derived from a logical, rationalist way of viewing the world. This says that social phenomenon can be observed, simplified into modeled patterns, and then modeled. Compare this to the phenomenological approach, which thinks of society as something that is always negotiated and ever-changing, and that the context of digital technology is based on our observation of it (and our integration of it into our lives). This seems highly academic, until you think about the emerging fields of machine learning. Machine learning attempts to train models about human behavior with large datasets, and drives towards a predictive model about how people do things. It’s typically based on a fundamental belief that human behavior can be modeled successfully — a positivist approach. But people do strange and often unpredictable things that can’t be modeled. When they talk to Alexa, they know things it doesn’t. They know, for example, that people in a room prefer different styles of music and may argue and fight over what’s played; that people change their minds; that people get drunk and act on impulse, and later regret it; that people hold grudges, make irrational decisions, and harbor resentment towards one another. A phenomenological approach to technology would take a stance that not only can this not be modeled in a rational sense, but that it shouldn’t be modeled because it will lead to a disjoint and broken relationship between people and technology. These perspectives have real-world implications on the types of projects designers take on, the places they work, the design decisions they make when working on digital technology, and the strategic business considerations companies make related to the changing wants and needs of the market. Theory informs practice. Without knowing the types of things described above, decisions are still made, but they are made with a less informed, less thoughtful consideration. I want my students to be considered in the choices they make. 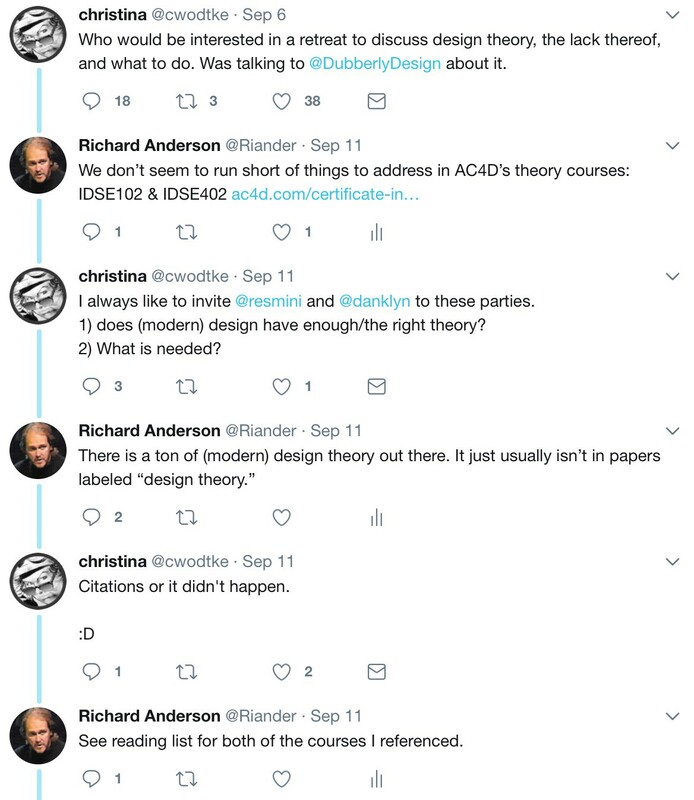 Richard: A point that I want to emphasize is that design theory need not “seem academic” or even be called (design) theory or appear where one might first think to look, which is well-reflected, I think, in many of the other readings assigned for AC4D’s two theory courses. For example, Emily Pillotin’s “Depth Over Breadth: Designing For Impact Locally and For The Long Haul” — which you assigned and which Emily wrote for us when we were Editors-in-Chief of interactions magazine — is readily accessible, accompanied by examples of her work explaining its applicability to practice. Much of what Ian Bogost writes for The Atlantic is design theory, including the recent “Why Nothing Works Anymore” which I assigned to be read for AC4D’s advanced theory course though, in it, Ian argues that design isn’t so much at fault. Harvard Business Review, which you mentioned earlier, contains design theory, including things you have written and “Creating Shared Value” by Michael Porter and Mark Kramer (which I assigned) which has dramatic implications for what design(ers) could and should be doing in major corporations. I’m a big fan of Twitter, and I include tweets a lot in my talks, teaching, and writing, and many of those tweets (including many I choose to retweet) and many others I see daily include design theory. Even my Twitter exchange with Christina Wodtke (see above) includes (i.e., not just points to) design theory. 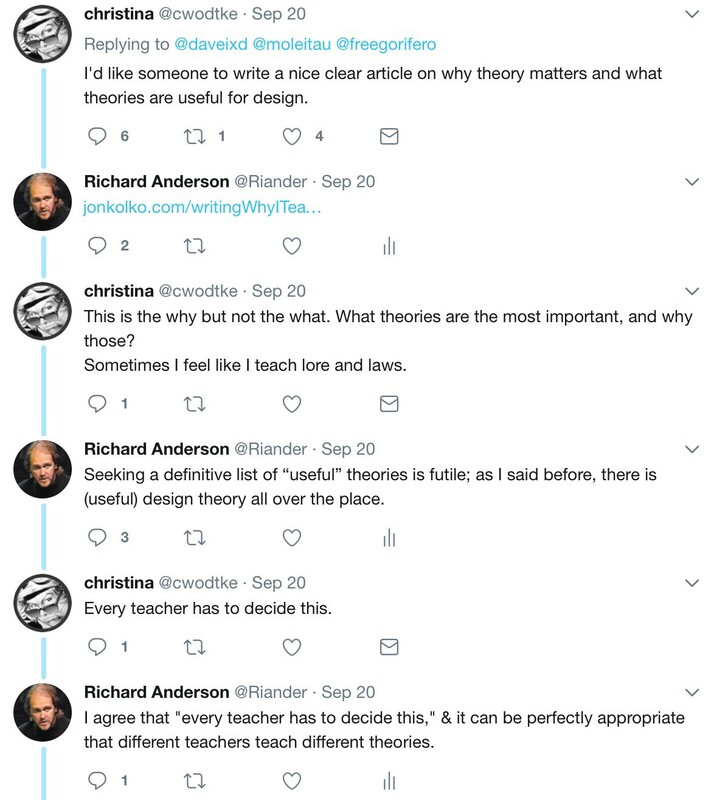 In my view, your writing — which you referenced above and which I referenced in my exchange with Christina — on why you teach theory includes design theory. Design critique — about which you’ve written lots and which is a critical part of good design practice — relies heavily on design theory. Reign me in, if you think such is appropriate. But in my view, any design practice reflects design theory, and it is important to acknowledge and understand that. Practice and theory are intimately intertwined. Jon: They are. But, and maybe this is a shift from what I mentioned above, I can empathize why a hiring manager may be reluctant to hire someone who calls themselves a theorist or overly references theory, because sometimes those people value argument (and often for its own sake, not for a larger purpose) over making. The comment is ridiculous; the thread is ridiculous; the idea that anyone needs to spend time talking seriously about “if we learn from books” is ridiculous. But, for many, this is “theory” — this is what practitioners imagine academics spend their time doing and worrying about. I don’t think this is what academics spend their time doing, generally, but this is what hands-on, in-the-trenches designers see and judge. And so from that perspective, and back to your very first question (“But is there no place for theory in a professional work environment?”), I’ll offer: yes, there is, and there should be plenty of it. But as an academic, I need to understand how pontification is viewed by practitioners, and ratchet my behavior up or down depending on the context. Over time, I can shift the perspective of my team or client by delivering great work with a thoughtful underlying theory. But in the context of a real world design problem, intellectualism without the substantiation of tangible design artifacts is just noise. Richard: Fortunately, I’m not prone to pontification. (We’re not pontificating in this piece, are we? 😉) Nor have I ever called myself a theorist, and in the context of the interview I mentioned at the start of this piece, never once referenced theory or a desire to teach it. Indeed, I’ve taught theory rarely, other than to the extent that theory is always being taught when teaching practice because of how the two are intimately intertwined. My concern is that theory and its relevance to practice isn’t understood, and hence any association with theory prompts fear and concern among many practitioners. In my view (and I think in yours), practitioners need to attend to theory more explicitly in their work, or, as we addressed in “On the relationship between design and activism,” risk ignoring or even knowing their convictions and, hence, risk just being passive economic servants. A human-centered design practice, management, & organizational strategy leader/consultant/teacher/commentator, largely focused on social innovation.